It's taken years for me to learn, but when Paula says something like, "I don't have a place to keep the dies for the Vagabond machine all together." The translation is, "can you build me some sort of shelves for them?" Her collection really had outgrown its previous storage locations around the studio. Since her Vagabond lives on a counter top in the studio where the basic Sizzix supplies are stored in the drawers below, this was the logical place for it. Some quick measurements proved that shelves would fit perfectly behind the Vagabond. The first step was to decide on what size to make it. The width would be the same as the cabinet it would sit on and the height would be somewhere between 45"-47" depending on the how many shelves we put in. Final dimensions are 311/2" x 48". Now for the shelves. 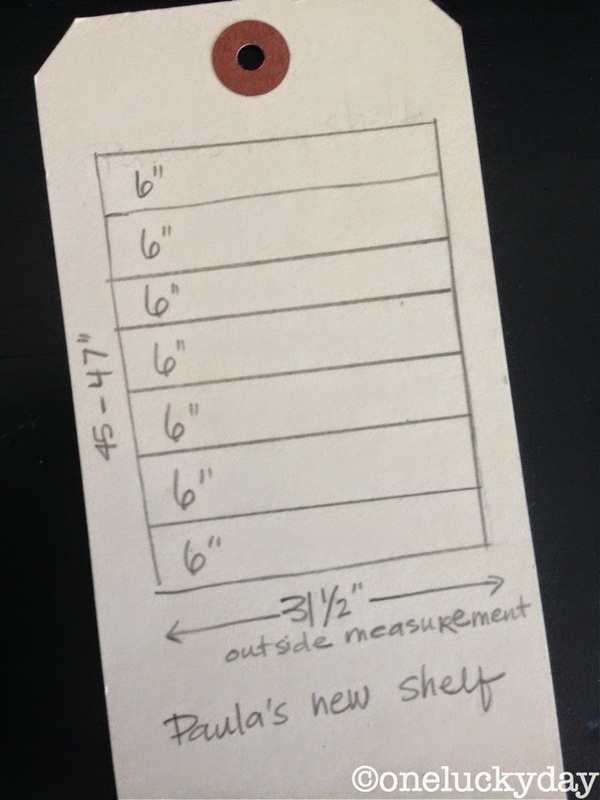 Since the dies are 51/2" x 6", we settled on a depth of 61/4" and height of 6" between shelves. With lumber in hand, first step was to rip (trim the boards going with the grain) to the proper width (61/4") on the table saw. This is always a fun way to make loads of saw dust. The 8' board was cut in two pieces, 47" each (sides) and one of the 6' boards was cut in two pieces 311/2" each (the top & bottom). At that point, I could have easily just grabbed some screws and done a layout of the pieces and screwed it all together. Just about the time I start thinking that way the voice in my head says, "do it right or don't do it". Sometimes that my grandpa's voice, but usually it's Paula's dad's voice. Okay, then. Dado joints and rabbet joints it would be. So, with that motivation, I carefully measured and sketched the layout of the shelves on each of the sides with pencil. I then used a Skilsaw to cut the outside edge of each dado joint that the shelf would fit in. 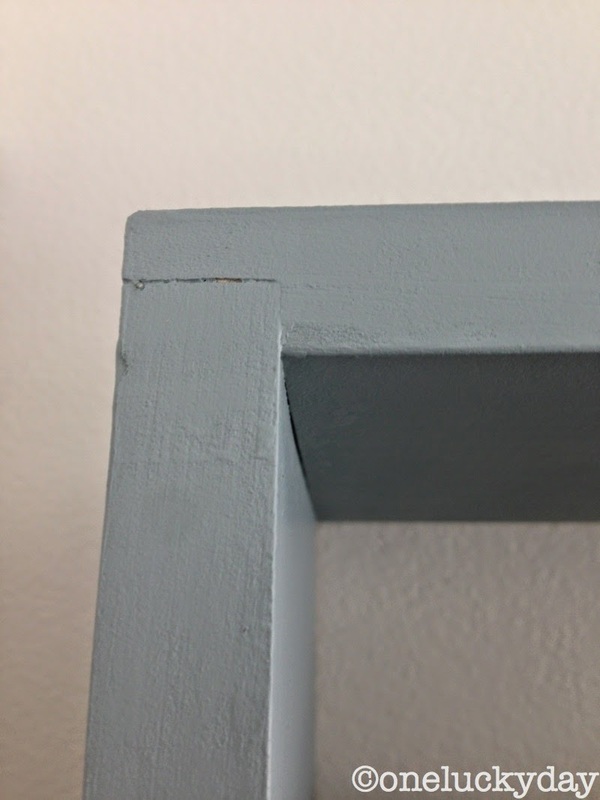 The final step was to use a router bit to trim out the rest of the joint making sure that the shelves would make a snug fit (see picture below). I used a similar process on the top and bottom to make a rabbet joint for the sides. 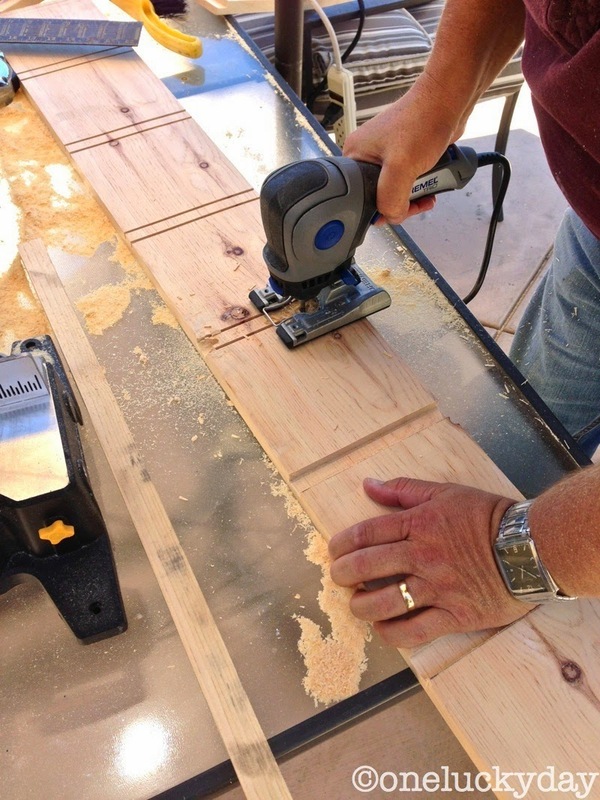 Once the boards were cut, all of the pieces got a good sanding first with 100 grit sand paper and then with 220 grit. Now, it was just a matter of fitting the pieces of the puzzle together. To assemble, I just needed some wood glue. I did use some finish nails to hold the top, bottom and sides together. Once the exterior was assembled, I made a final measurement between the dado joint on each side for the shelves. They needed to fit in that dado joint and trimming the shelves to 305/8" long was a perfect fit. Applying some wood glue to the joint and with a little coaxing by a rubber mallet, the shelves fit into place, no nails or screws needed. Paula had decided she wanted it painted her current favorite color, Iced Spruce. So, off we went to the hardware store to buy a quart of paint. Benjamin Moore Paint doesn't call it Iced Spruce but I swear that's the color it is. 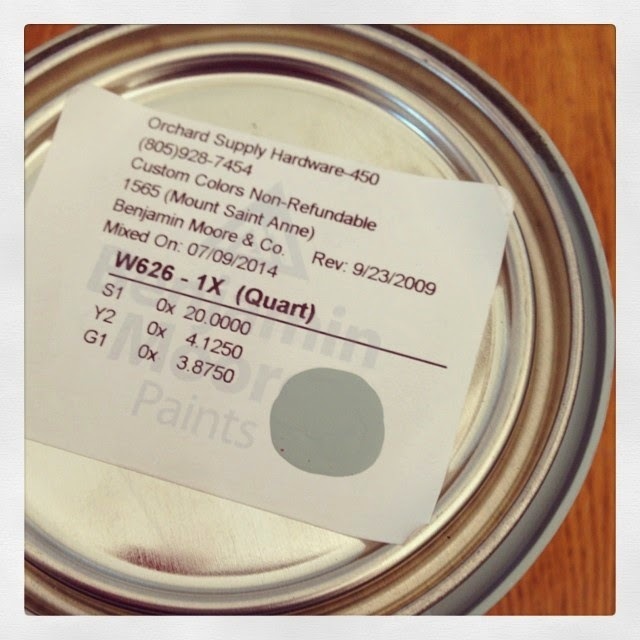 The Benjamin Moore color we used was 1565 Mount Saint Anne. 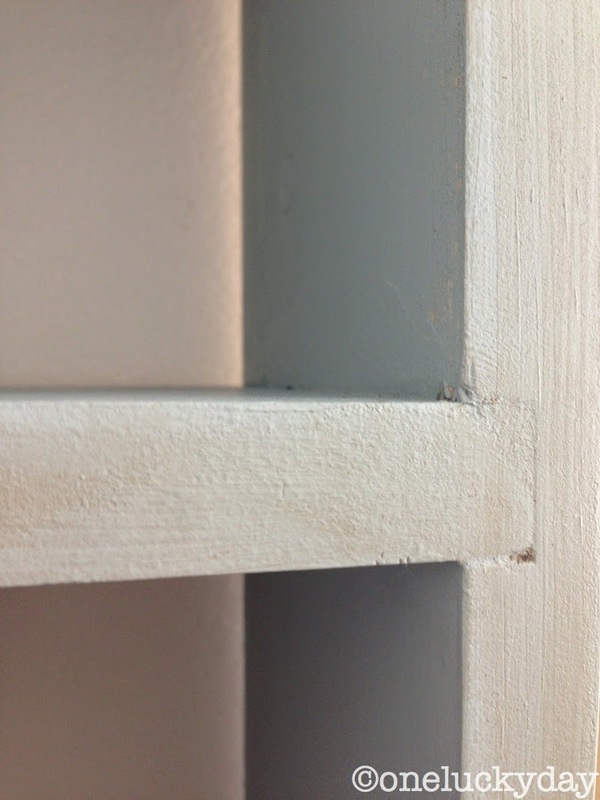 After I painted it, Paula used her magic and sanded the edges, then rubbed on some brown paint to grunge it up a bit. 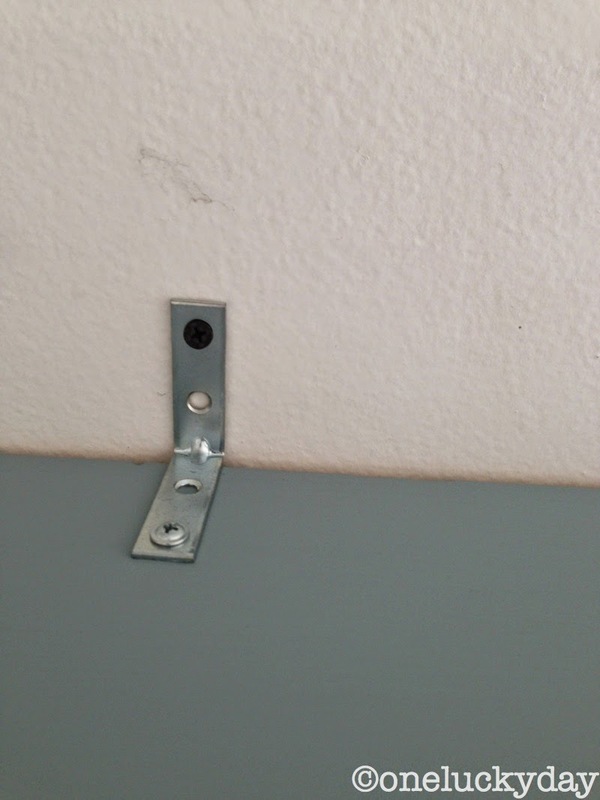 Once painted and grunged, we put it in place and used a simple L bracket screwed into the top and the wall to keep it from tipping over. That would not be a good thing. First, thanks to my husband for building me such an awesome cabinet to store the dies. When I started putting the dies in I realized it was going to hold WAY more dies than I thought. Each shelf can hold about 40 Bigz dies (8 per stack). So I had plenty of room to organize them! I have Halloween on the top shelf. Christmas on the second shelf and then alphabetically after that. My Bigz XL dies are on the bottom shelf since they are the heaviest. On the edge dies and Frameworks are on the shelf right above. I still have plenty of room to grow the collection over time. I also love the fact that I now have some room to display some of the cards I have created for blog tutorials. I have never really had that kind of display space available in my small room. So the space that used to be occupied by a rarely used bulletin board is being put to a much better use these days. Cheers to that! Now he needs to stop by Jennys, your house, then Kath and Astrid in Scotland! We will be on a grand tour of Europe! Your Jay sounds a LOT like my dad and my hubby, John! Your new shelving is Fab-U-lous and I know you will get many years of enjoyment out of it. I agree with Cardgenie with how lucky you are with one addition: to have so many dies! Swooning! Love the color you chose as well as the display. WOW! Wonderful storage for your amazing die collection. You have arranged it so nicely. It's great that you have plenty of room to grow. I love the color Iced Spruce too, great that you could match the color and that you grunged it up. Jay is a very creative guy and a great guest blogger. Amazing storage Paula! That husband of yours is a keeper! 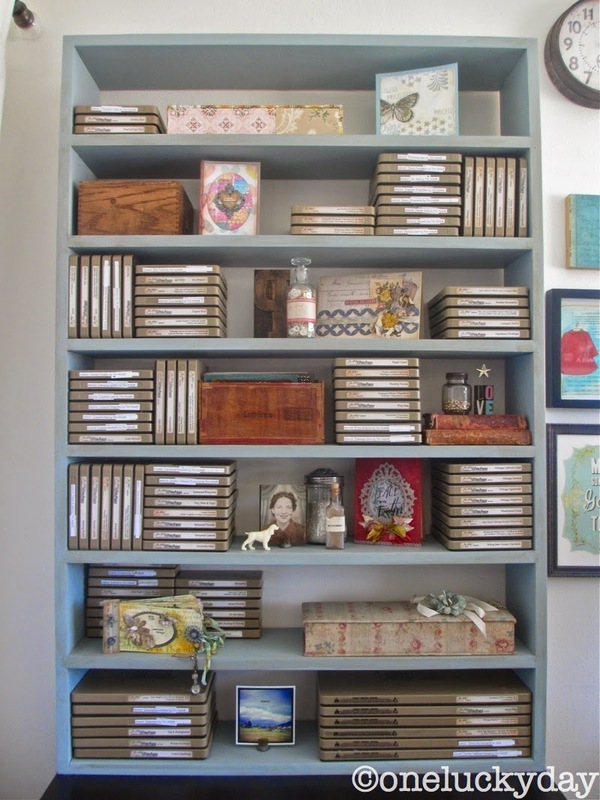 Fabulous shelves for your collection of dies, Paula! Thanks for sharing this with us! Happy Birthday! This looks like an incredible job. You are lucky to have a hubby like Jay to make things for you. Please tell him thanks for the step out pics, my hubby is also great at making stuff like this and it really helps to be able to show him projects like this build. Jay - your storage solution is awesome! Great to see a man with practical "man skills"! Paula - you need more Christmas dies!!!! Making a custom storage solution is ideal and you are lucky to have a hubby with such awesome carpentry skills. The tutorial was great and I'll bet this project gets on many to-do lists. Wow, two wonderfully creative people! Love the shelves! Lucky girl! Found myself a shoe organizer the other day to put mine in, makes a world of difference to have the dies at a arms reach away. Might have to make me one of these super duper ones in a few years after my collection of dies grows. Enjoy! Paula and Jay, This is so great! 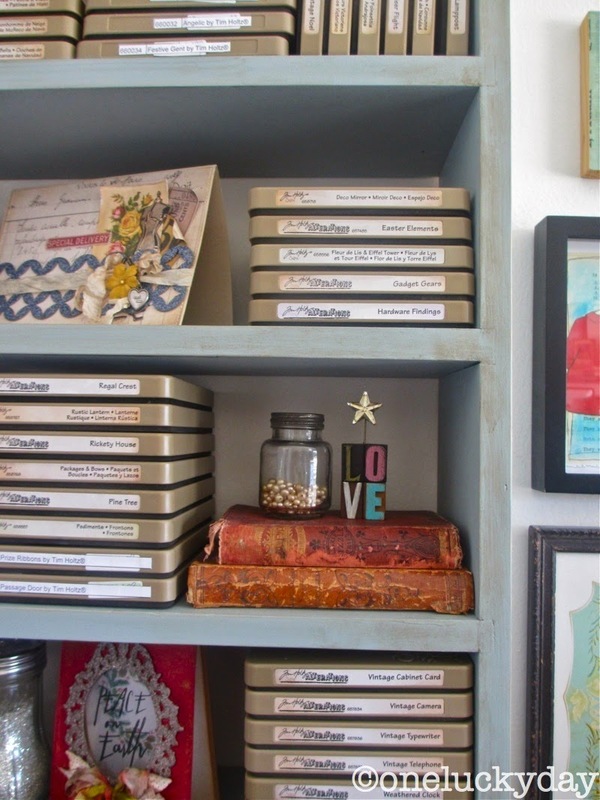 For months I have been thinking about asking you how you store your dies. In the back of my mind I thought Jay would be making something. Aren't you having a birthday Paula? Nice gift! Perfect solution - great teamwork! Great job Jay ... I love it !! Paula it looks so nice love your arrangement !! Jay did a fantastic job! This is a wonderful storage idea....and the iced spruce color is fabulous. Can he make one in evergreen bough? Love the shelf! Too bad my DH is not a carpenter. :) I'm sure I can figure it out though, my dad was a cabinet builder. wholly moly that is a lot of dies. how fun is that? the shelf is totally neat! I just need another wall!!!! Gorgeous job. you too were a great team...and the result is beautiful! Thank you for sharing and for the directions. What a lovely cabinet your husband built. You have styled it beautifully. Belated birthday wishes to you. Gorgeous and so practical! Nice to "see" you, Jay. Jay is a Keeper! Beautiful work Jay. So, there is 2 very talented people living in your household! Love that Ice Spruce was your choice of paint. Along with Weathered Wood, it is one of my favorite colors, as well. The shelf looks so awesome. I too, am fortunate to have a handy hubby. What on earth would we do with out them? Have a gorgeous week and hope you get to play with all those fab Dies. Anyway, love this fabulous new storage and yes, if both you and Yay ever fancied a trip to Scotland, we have the tools (and a very nice guest room)!! Seriously it looks brilliant and I love that you can display some of your artwork too. Makes it look so uncluttered, just fabulous!! So it looks like Jay and I need to come to Scotland so he can build a shelf for Kath and one for you Astrid! Oh, that's what I'm talking about! Every crafter's dream! Great choice of color, too! Thanks for sharing; our husband's deserve more credit for the things they do to help us do what we love. Oh Paula.... he's a keeper and I love that storage and I LOVE your collection and I wanna come play at your house. Looks amazing. anytime Val. I'm sure we could create such a big mess on the table! Wow, this is fabulous! I love the shelf, it is absolutely perfect! I too have very little space and my dies are all over the place. I need to find someone who can build me this! Thank you for sharing Jay and Paula! Could Jay possibly build me one and ship it to Alaska? No? Too much? Wow! Lucky day for you :) Looks great! What a fabulous job Jay did on that shelf unit! Love it!